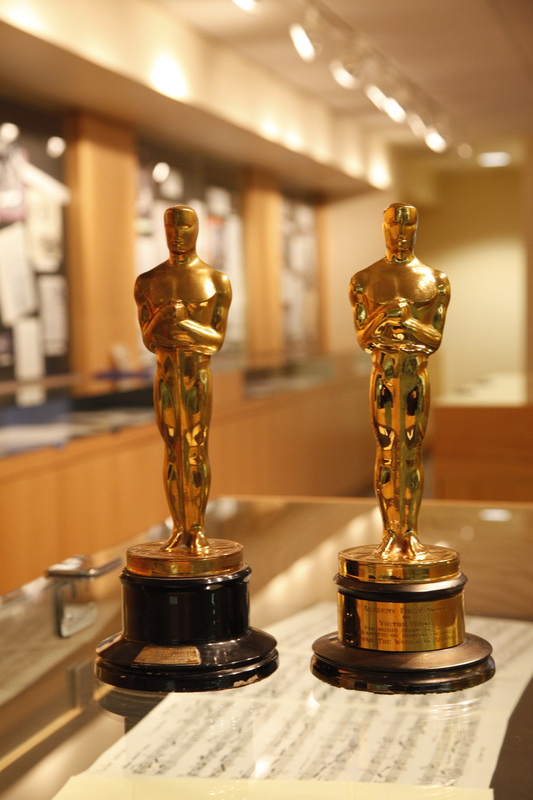 Brandeis Special Collections Spotlight: Oscars at Brandeis! On March 4, 2018, the Academy of Motion Picture Arts and Sciences (AMPAS) presented the 90th annual Academy Awards ceremony. Our readers may know that the ceremony, which began in 1929, was first broadcast on the radio in 1930 and first televised in 1953. But it may surprise our readers to know that Brandeis is home to not one but two Oscars* trophies! The first of these was awarded to screenwriter George Froeschel in 1943 for “Best Writing, Screenplay” for the movie Mrs. Miniver. The history behind this golden trophy is particularly interesting as Froeschel did not get the true award at the ceremony and had to wait until the end of WWII to receive his official statuette. Froeschel was not alone in this. All Academy Award winners between 1943 and 1945 were awarded a simple, painted, plaster Oscar instead of the usual metal man. This was as a result of a metal shortage during WWII. Each of the plaster statuettes was accompanied by a note stating that the recipient should return the plaster after the war in order to receive the usual metal oscar. Currently, the Froeschel Oscar is on loan to the Rose Art Museum, where it can be seen in the Mark Dion installation: The Undisciplined Collector. 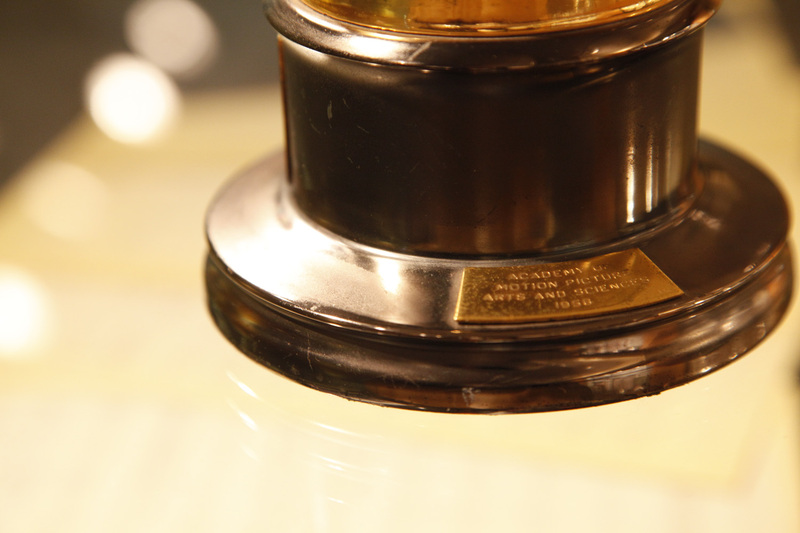 Froeschel left several of his prized possessions to Brandeis, including the Oscar, which we received in 1980. The second Oscar in Brandeis’s possession was awarded to Victor Young, a prolific American composer. Having been nominated twenty-two times for Academy Awards he finally won a posthumous Oscar in 1956 for Best Scoring of a Dramatic or Comedy Picture for Paramount’s Around the World in 80 Days. 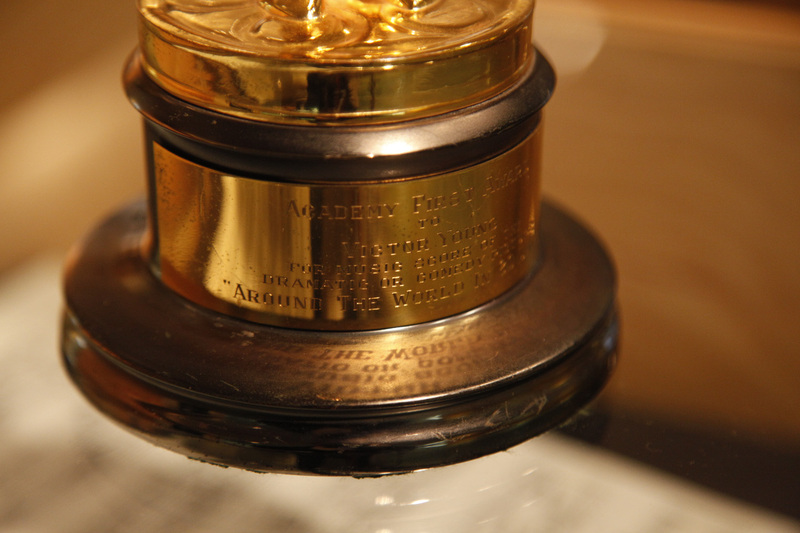 This award (along with Young’s Golden Globe (1952) and Primetime Emmy (1955), which Brandeis also holds) is a shining accompaniment to his wonderful collection of scores, his personal library of LPs, awards and memorabilia, sheet music, press clippings, correspondence, and photographs. For more information, peruse the finding aid and Spotlight for the Victor Young collection. The Victor Young collection was donated by Jacques Biroteau and Mrs. Rita Young in 1957. 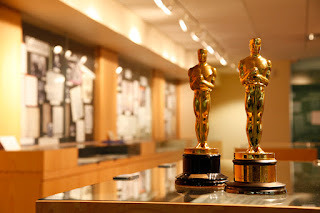 The Oscars are among our more well-known items because of their strong presence in popular culture; visitors are often invited to try holding them and to make an acceptance speech of their own. The statuettes are quite heavy and weigh in at eight and a half pounds. While the Oscars in Special Collections are made of britannium, since 2016 the statuettes have been constructed with a solid bronze core and are plated in 24-karat gold.